Late yesterday evening, a last package showed up at our doorstep. A padded manila envelope, clearly addressed to me - totally mystified, I opened it. Inside I found this fun, fun turtle cookie cutter enclosed in a ziploc baggie. No note, nothing to indicate who it was from. Just a mystery Honu, who somehow washed up on the shores of chilly Seattle instead of sunny Hawaii. Since I happened to have sugar cookie made up and ready to roll, I put him right to work today! Then I decided he needed a couple of friends to make him feel more at home. 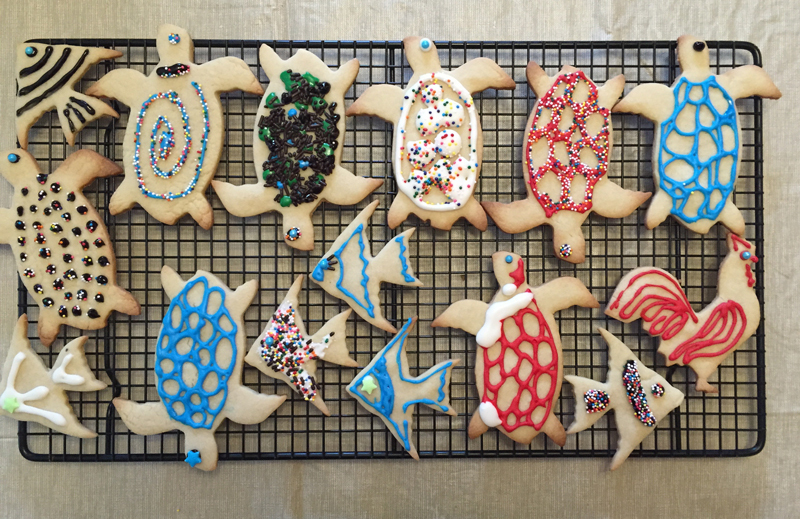 My cookie decorating skills are about on par with a child playing with finger paints. They will NEVER win any awards, but they sure are fun! I do like the rooster - I think he is definitely my 'best decorated'. Joe snapped this one of my Santa Turtle. 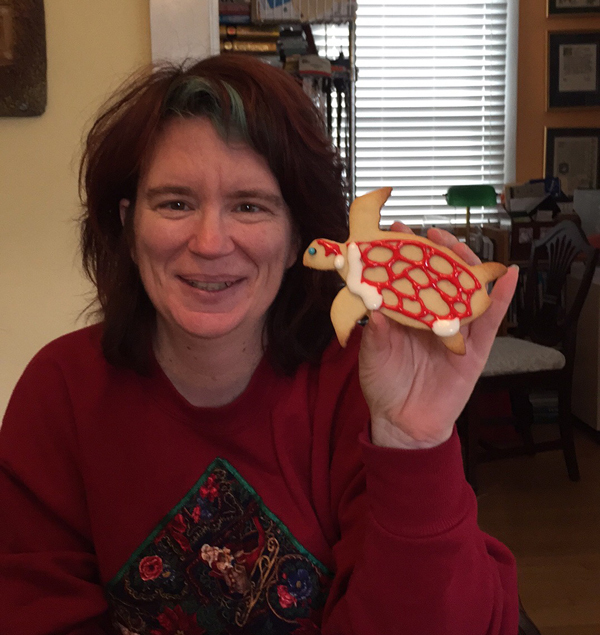 So, to whomever sent me the turtle - thank you! He sure is fun. And Merry Christmas to all of my friends who celebrate the day. Here's hoping for a day filled with light, love and laughter. 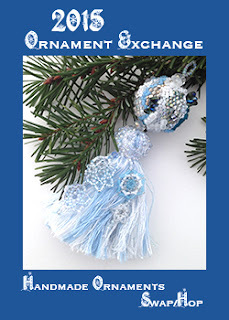 Just over a month ago, I sent out an invitation to participate in my first annual Ornament Exchange and Blog Hop. Time has truly flown by and today is the day for the Blog Hop Reveal! 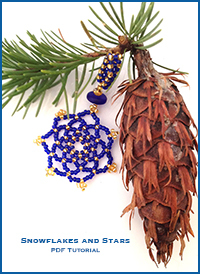 After I paired each participant with a swap partner, it was then up to them to exchange emails and handmade ornaments. 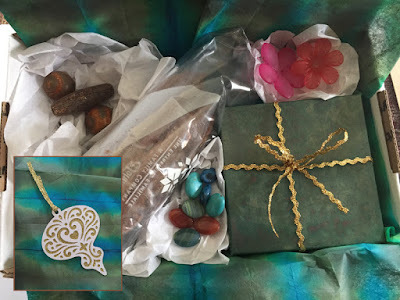 My only 'rule' for participation was that the ornaments had to be handmade by each participant and had to include at least one bead in the design. 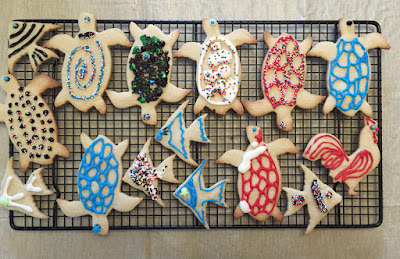 Thank you all for joining in for this bit of holiday cheer! Liz and Becky don't currently have blogs of their own, so they sent me photos to share in a separate post here. From my perspective, I love how these swaps allow me to get to know other beaders and artists from around the country a little better. I'm afraid the package that Carrie sent to me seems to have been temporarily lost in the mail. It was coming from Hawaii, so maybe it decided to spend an extra day, or maybe a week or two hanging out at the beach before making it's way to oh-so-rainy Seattle. Can't really say that I'd blame it! Even still, it's been fun getting to know Carrie better as we exchanged emails regarding our holiday traditions and favorites. 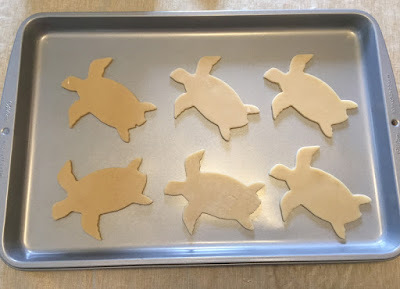 While Carrie enjoys many of the more 'traditional' holiday themes, she admitted that since she's lived in Hawaii, she's "grown to be a fan of the local Christmas themes such as volcanoes, seahorses, hono (sea turtles), pineapples, monstera leaves, petroglyphs, palm trees, coral, jellyfish, starfish and reef fish". 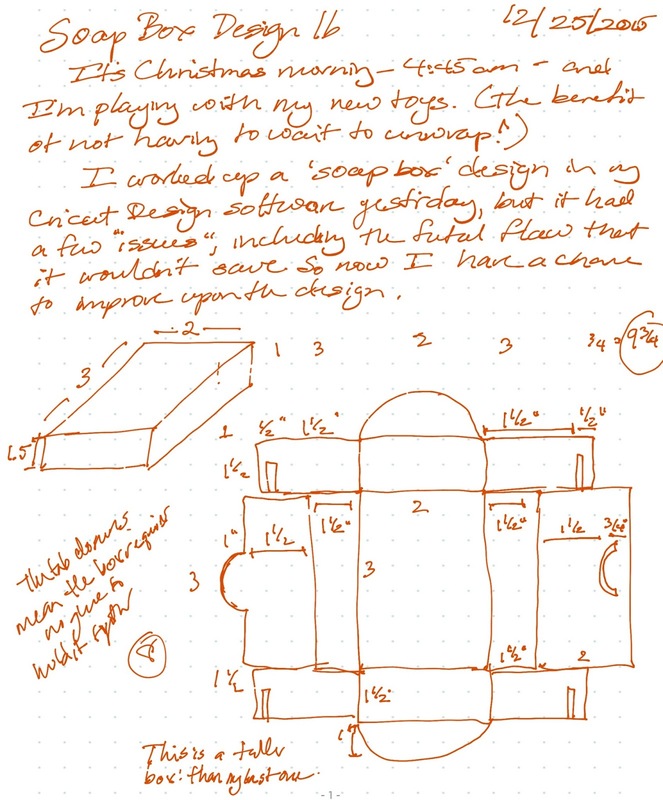 Reading that, my original plan to send her a more traditional holiday ornament began to morph. She also mentioned that her favorite color is the new Toho 2600F "Lemongrass", followed by "lime greens, teals, orange, orange-reds, periwinkles". She continued "pretty much I love all the greens - especially olives and limes, oranges. Bronze/Browns/Coppers/Silver - all good." So not necessarily the normal Christmas colors. Can you guess where this is going? 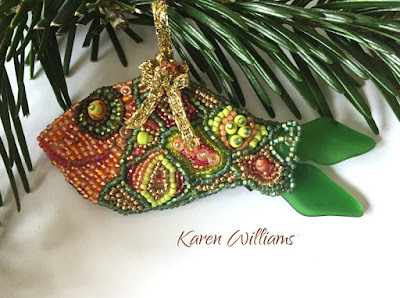 Yep, I decided to make her an ornament in my Happy Fish series. Because it was going to be a Christmas ornament, I decided to work with an ogee pattern for the scales. What could be more ornament-shaped, right? I wrapped the little fish up in a hand-painted box, then added a couple of other things to the shipping box, including some of my biscotti and a little paper ornament I made. I haven't heard yet what Carrie thought about my unorthodox creation. I'm truly hoping she liked it. In the meantime, I know that I had an absolute blast stitching my newest Fish friend. Now, be sure to check out everyone else's ornaments, and I promise to post Carrie's as soon as it arrives. Becky Clay and Liz Hart were definitely on the same wavelength with their ornament exchange, despite some initial difficulties in connecting via email which left very little time to stitch. 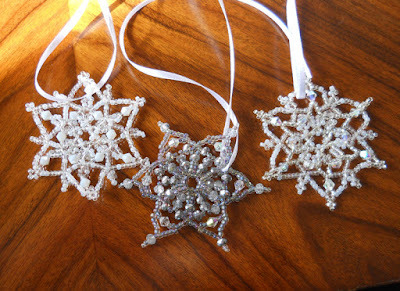 Both choose to use Sandra Halfpenny's Snowflake patterns. 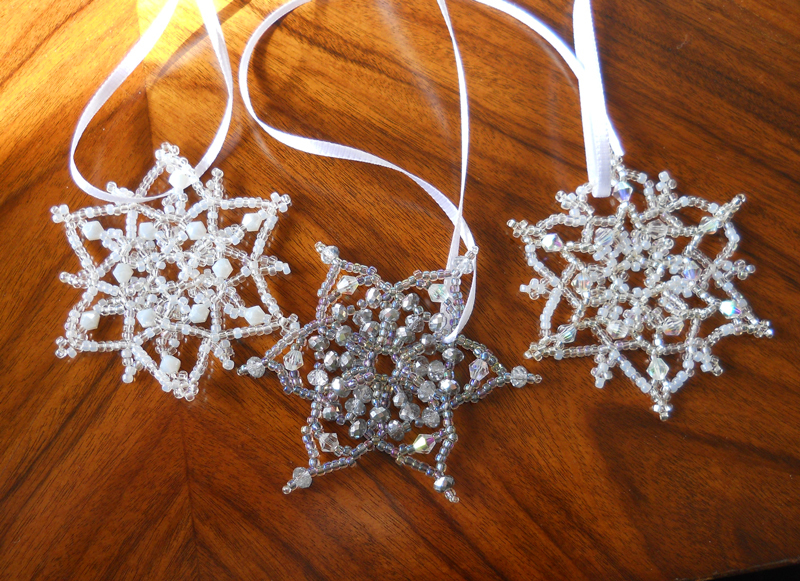 Liz started making snowflakes from Sandra's designs, then started playing. The white one is Sandra's Snowflakes Falling. She mentioned that the pattern is available on Sandra's blog as a Christmas gift to her readers. 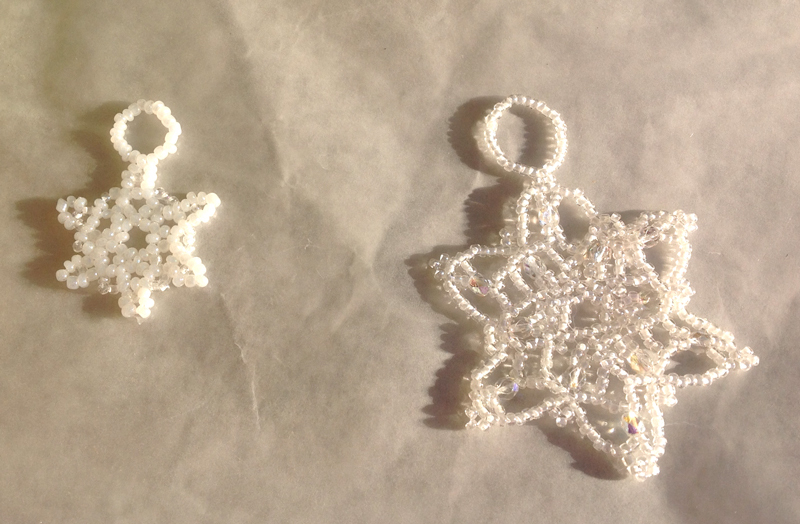 The other two designs Liz sent were hers; same design with different beads. Becky's icicle was a free icicle pattern she picked up from TheBeadsKnees that isn't currently available, unfortunately. 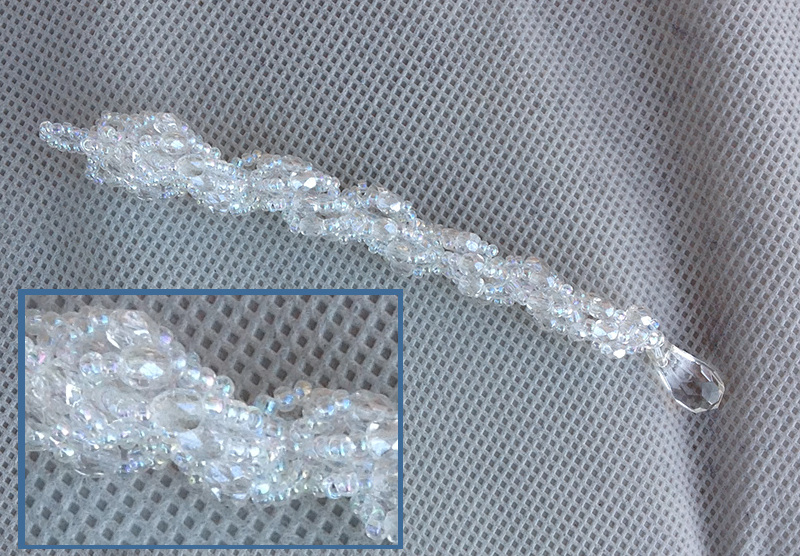 Becky's icicle, along with a closeup to try to show the beading. 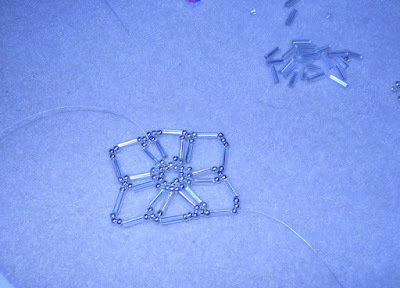 Not all of Liz's snowflake experiments went according to plan, as she shares in this process photo. Oops! 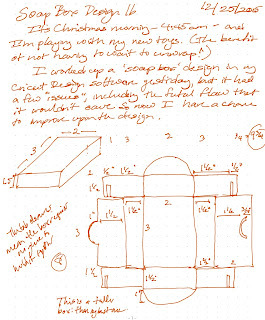 List sent along the photo above with the note "You'll get a kick out of this process pic - it seems my fingers and brain weren't connecting very well!" And here's one last photo from Liz of the snowflakes she stitched for Becky. Lovely! Looking at the ten-day forecast for Seattle, it's looking far more likely that we'll have a Wet, rather than a White Christmas. But no matter! 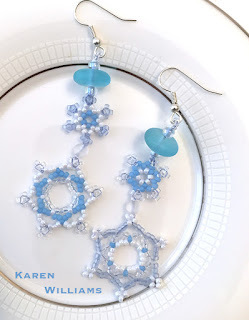 There will be snow flurries a plenty this Sunday at Fusion Beads, where I'll be teaching my third-annual Snowflakes and Stars workshop. Happen to be in Seattle this weekend? Whether you need a quick last-minute gift or simply want to treat yourself, consider joining me for an afternoon of some holiday beading fun. Not in town? 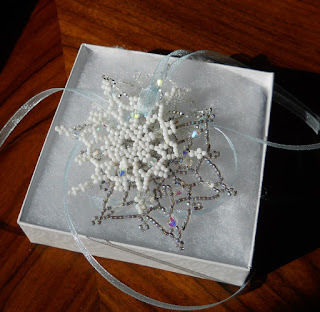 My Snowflake and Stars tutorial is available through my Etsy Store as a PDF download. 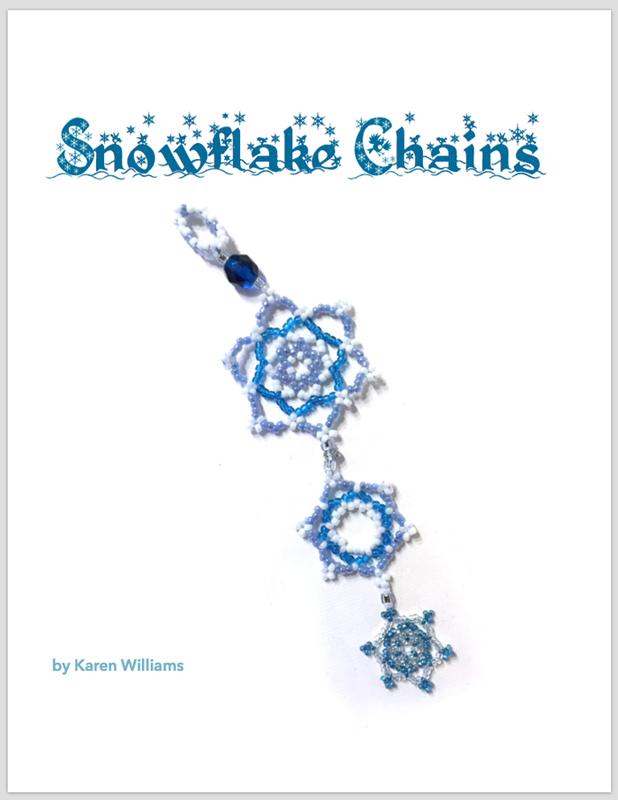 It's also not too late to claim your free copy of my Snowflake Chains holiday special. I've extended the offer through January 2nd, 2016. Preparing for a workshop early last month, I pulled out the pattern for my Cap Beads from my book Corsets, Caps & Stays: Elegant Beaded Beads. 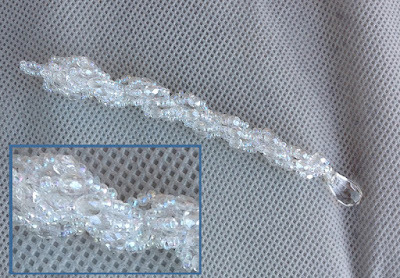 What would happen, I wondered, if I used some of the fun, shaped beads that have come out since then? 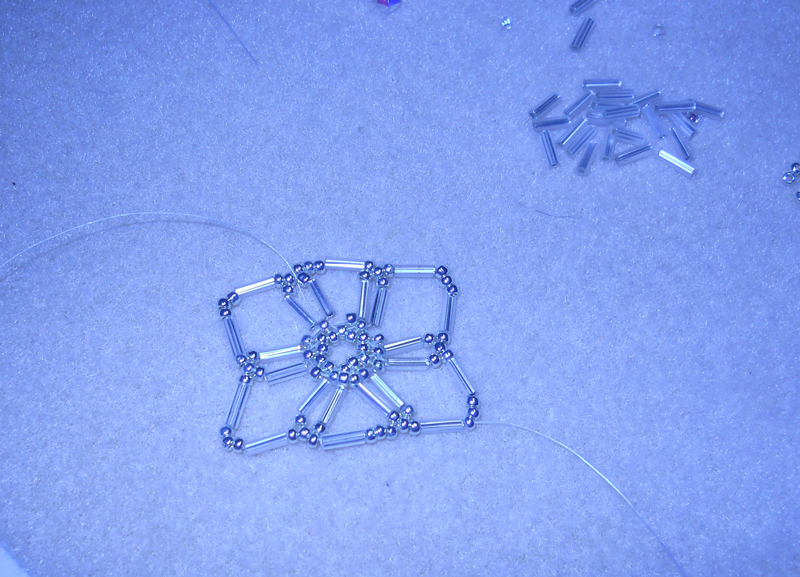 My new Criss-Cross Lantern beads are the result. I promised my students that I'd send them the revised instructions, including this variation. And here it is, nearly a month later! I've heavily revised the original pattern, doubling the number of detailed bead diagrams and added all-new instructions for the Lantern Bead variation. 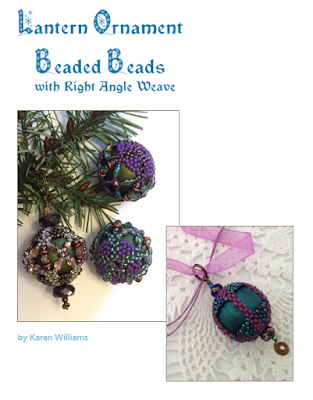 The Lantern Ornaments Beaded Beads PDF pattern is now available in my Etsy store. To celebrate its release, I'm offering a special deal. ** If you purchase a copy of my original Corsets, Caps & Stays book (either paperback or digital versions) now through December 15th, I will include the download code for my Lantern Bead PDF tutorial with your purchase. 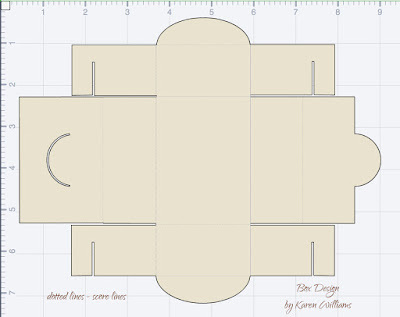 ** Also, for friends who already own a copy of my original Corsets book and are on my mailing list, my next newsletter update will include instructions for how you can claim your free copy of this new pattern. To simplify my life, I've decided to post all free updates via my email newsletter from now on. There's only one of me and trying to keep track of who purchased what, from where, and when gets to be sooo crazy, especially since I have no way of tracking Amazon sales. 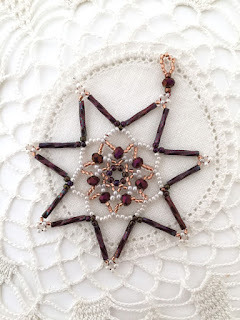 Trying to track everything takes up a tremendous amount of time that I could otherwise use for designing, beading and writing. 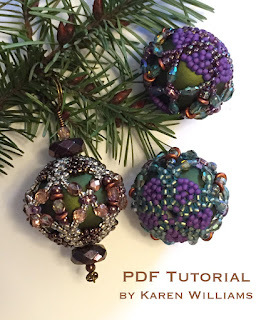 From now on, I'll post update opportunities in my email newsletters, along with simple instructions on how to claim your PDF updates for my patterns that you've previously purchased. Not on my mailing list? Click here to sign up. Normally I send out one to two email updates per month, sometimes a little more, sometimes a little less. It all depends on what's going on. This month, I've decided to get ambitious! My plan is to send out a special update every Wednesday, starting tomorrow for the next three weeks, with a new pattern addition or update code. 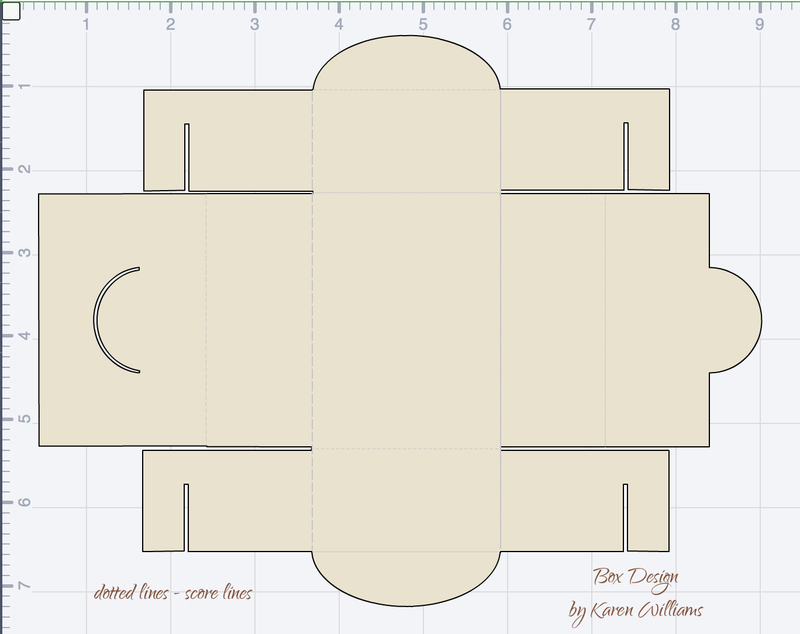 If you already own the base pattern (or purchase it during my promotion), you'll receive the updates for free. Next week I'll be sending out an addition to my Snowflakes and Stars tutorial. This is my way of saying thank you for helping to make it possible to do what I do!